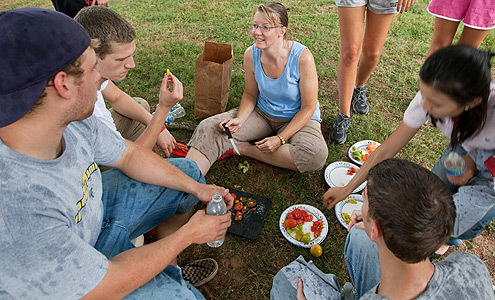 Wake Forest University’s Campus Garden overflows with tomatoes. But, with names like Never Ripe and Green Ripe, many will never be the rich, red orbs you’d slice up for sandwiches. These tomatoes – mutant varieties bred for research – will help Gloria K. Muday, Ph.D., a professor of biology, determine how the hormone ethylene can inhibit or aid root development. “If we can encourage tomato plants to form deeper root systems, those plants will be able to take in more water and pick up nutrients more effectively,” Muday said.